Register your website with the most important search engines. 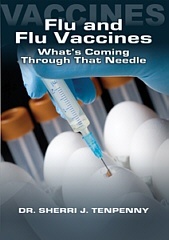 Home » Products » Flu and Flu Vaccines: "What's Coming Through That Needle"
"What's Coming Through That Needle"
This video exposes enormous amounts of vital (fully-documented) information that the mainstream media has completely failed to report. This information is so compelling, it will cause even the most difficult skeptic to rethink their position on vaccine safety. Below is a video containing several sample video clips from this DVD. Click the PLAY button to view the video. "Dr. Sherri Tenpenny's reputation as a leading expert on vaccine issues is well-deserved." "Dr. Tenpenny is the voice that parents need to hear when they want the facts needed to make informed decisions about vaccines. No one can do it better." Author of "Our Toxic World, A Wake Up Call"
"Dr. Tenpenny is a major force in the careful and detailed analysis of vaccine safety and efficacy issues—A premier researcher and educator." "Dr. Tenpenny is a gifted educator: Her search for honestly is refreshing. 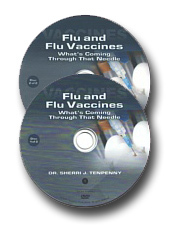 "Dr. Sherri Tenpenny has excellent insight and a unique ability to organize and present material regarding the very complex picture of vaccine safety."